Fire in multi-residential building on Kathleen Avenue in Sarnia. April 12, 2019. Photo by Sarnia Fire. Sarnia police were holding the scene of a townhouse fire Friday afternoon. 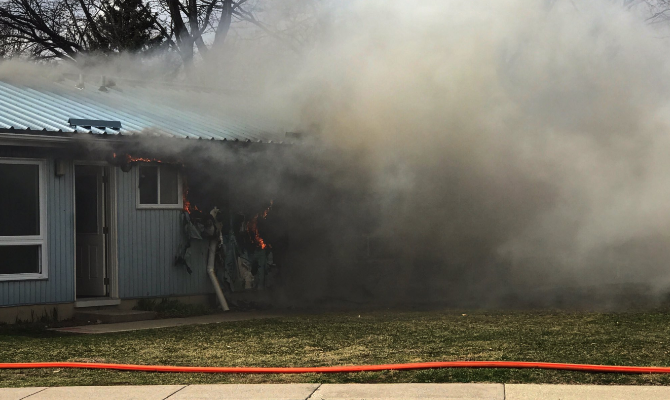 At around 3 p.m., Sarnia Fire and Rescue responded to a multi-residential building on Kathleen Avenue near East Street. Thick smoke was billowing from the roof when crews arrived and there was extensive damage to a unit. Platoon Chief Brad Allen said 15 firefighters from three stations helped to extinguish the blaze, and no injuries were reported. He added that the cause of the fire was under investigation and the Ontario Fire Marshal’s Office was contacted. Police reported via Twitter Saturday that charges have been laid. A damage estimate has not been provided.